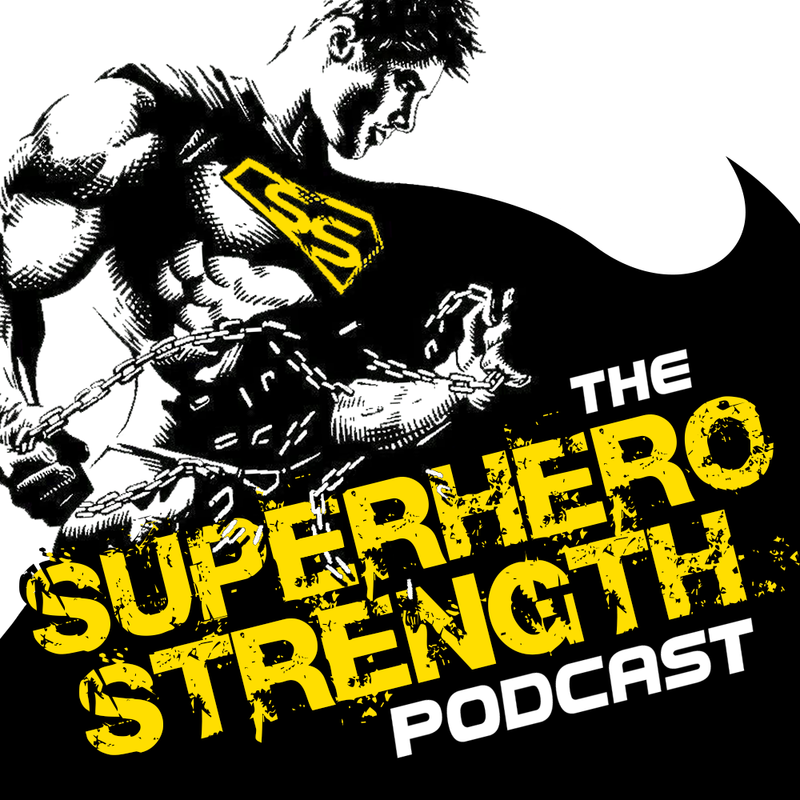 NERDSTRONG ON THE SUPERHERO STRENGTH PODCAST! 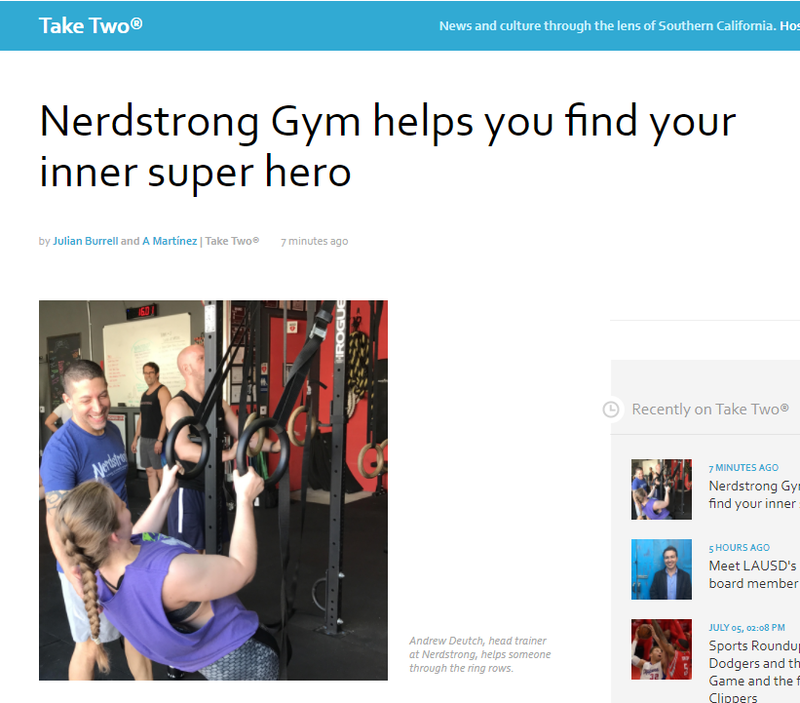 NERDSTRONG ON KPCC'S "TAKE TWO"! NERDSTRONG IN THE NY POST! NERDSTRONG IN THE NEW YORK TIMES! NERDSTRONG GETTING SOME LOVE FROM AUSTRALIA! NERDSTRONG TAKES ON "MOSTLY HARMLESS"! Steve Zaragoza from Comic-Con HQ's popular show "Mostly Harmless" stops by for a superhero workout of epic proportions! NERDSTRONG FEATURED ON MOTHERHOOD IN HOLLYWOOD! "Bottom line, I love it when people use their passion to create something they love and it’s clear that’s what the owners of Nerdstrong have done." NERDSTRONG ON GEEK & SUNDRY! 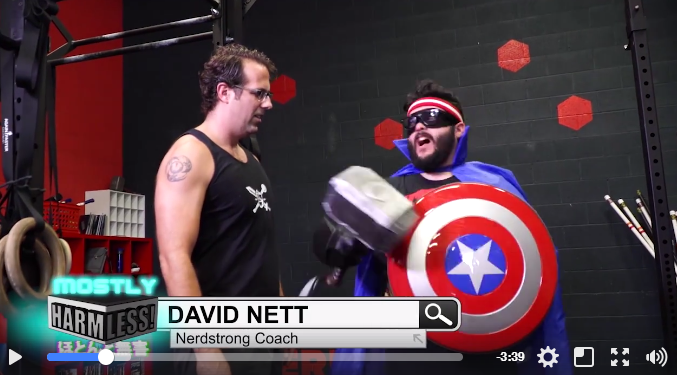 "Andrew Deutsch, the founder of Nerdstrong, had zero intention of ever starting his own gym. His workouts began at home, in his own garage. Andrew’s friend David soon joined him and then more of their friends joined them. David ran a Dungeons & Dragons game that Andrew played in, which inspired them to create themed workouts." NERDSTRONG ON "WAIT WAIT... DON'T TELL ME!" ON Npr! NERDSTRONG ON THE A.V. CLUB! "...a gym has opened in Los Angeles that caters exclusively to the “nerd” crowd. 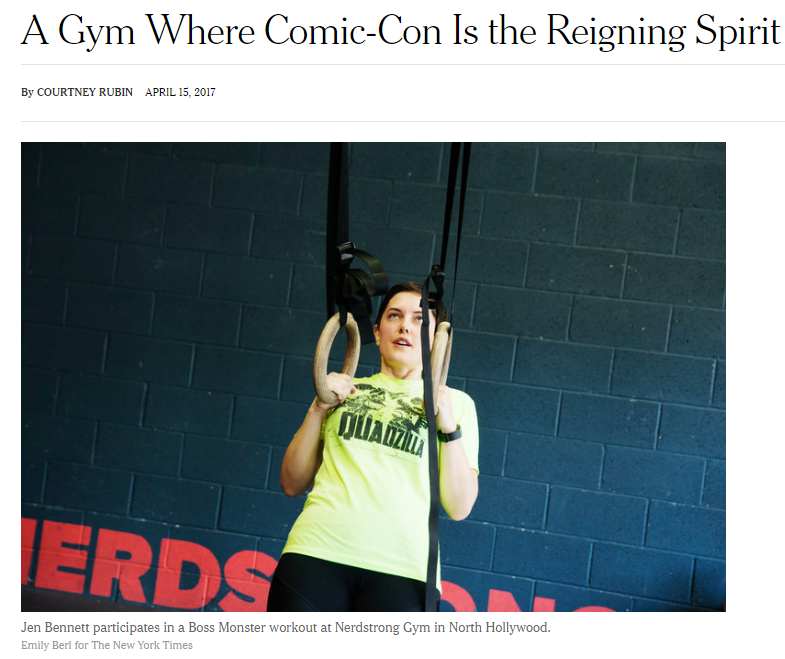 It’s called Nerdstrong..."
"There’s a North Hollywood gym hitting this workout problem head on and focusing specifically on a subset of culture that doesn’t get a lot of gym time: nerds." NERDSTRONG ON THE MAJOR SPOILERS PODCAST! Major Spoilers Podcast, August 2015: Superheroes are fit, and there’s no reason why we can’t find an approach for everyone to lead a healthy lifestyle. From Fandomania, 2015: "Not all, but a lot of nerds don’t grow up being picked first in gym class. It’s a stereotype TV and movies have placed heavily into our minds, but hey — it has some truth to it. Showcasing a nice height and a love for Michael Jordan thanks to Space Jam growing up, my dad thought I was destined for basketball greatness. Sadly, I could never get the hang of running and dribbling. To this day it’s a science that escapes me. I’d rather stay inside and read Goosebumps anyways. Many could relate to this — many like Andrew Deutsch." "Forget bikini season. Members of Nerdstrong Gym hit the weights hard for con season. “That’s when we get in shape to cosplay at conventions,” said gym owner Andrew Deutsch." We are Bodybuilding.com's Gym of the Month for April 2015! NERDSTRONG ON CAROLINA IN THE MORNING! NERDSTRONG IN THE WALL STREET JOURNAL!